Justice in America is upside down! The average person does not receive justice when they get involved with the Court System. Justice is reserved for the 2%. Find out what you can expect from the system once your are involved with it! Find out about “Unjustice” in America! Macooh’s Book Store Let’s fix the system! Don’t just site around with nothing to do all winter. You could go on a California Vacation. One game could take 2 hours, all day or all winter, Eight games to play - from easy to difficult & 2 to 10 players. We’re bringing family & friends back together for fun! All images, script, software, advertising and other owned by others belong to them and may not be copied. 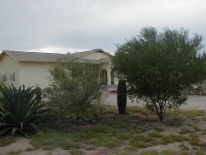 Spacious 2500+/- square feet home in Arizona with walls up to 14” thick with views of the mountains surrounding the property and view of the Maricopa Valley to the North. This home is on 1.64 acres and it has a four car - or, two car and an RV, Coach, Motor Home or Bus - 13’ tall carport. Trees and cacti includes Saguaros, Barrel, ironwood, Palo Verde, Palm and more. Chicken Peckers.. Strange & Weird Stuff. What Is It? We want answers! Have you ever wanted your own business on the main highway coming into Alaska from Canada? You can have your own pawn shop, gift shop, tavern and cafe, RV Park, fuel and convenience store or any other business. You could have one of these or all of these - the choice is yours. Year round or seasonal. 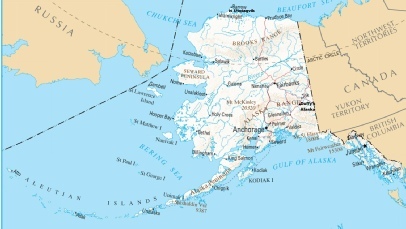 Do you want to do some serious Gold Mining in Alaska? Over 2000 acres of mining claims just waiting to be mined and they’re located on a belt of mineral deposits starting with Pebble to the SW and continuing N to the Chisna area and swinging SE toward the Nabesna Mine and Gold Hill. Beautiful 1.36 acre parcel in Sunny Arizona - just 33 miles South of Phoenix by 4 lane highway through Maricopa - with all utilities. Water, Sewer, underground Phone and Electric already installed to a perfect construction site on the parcel. Horses, kids, garden and dogs (cats too) welcome. Top 100+ Sites on the Internet. Click to see if your favorite made the list. Is that a “Keep Away” growl on our porcupines face - or a grin? Once you pan the gold out of this paydirt you will growl “Keep Away” and “Grin” because of the gold you recovered. 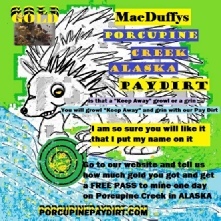 Click the “Porcupine” to go to Porcupine Paydirt or click on the PayPal Cart below.